Album artwork offers a glimpse of the great, mediocre, and ill-advised moments of a band's career. Click here for details on ordering as a poster, or email gsnider11@gmail.com. Because comics, like album artwork, should be viewed in large, printed form. 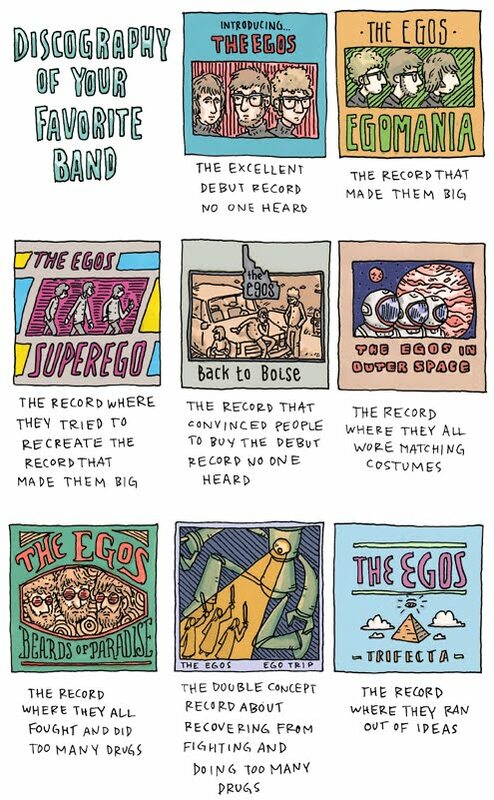 If you want, I'll throw in a complimentary mixtape of what this fictional band would sound like, had they actually existed. Been a music fan for about 40 years and seen exactly this more times than I can count! Hee! The last one should maybe have the parathesis "(And Also Ran Out of Drugs)". I always find myself liking the Double Concept Recovery Albums the best. Sad, then, that that's so close to the end of a band's life cycle. Missing is the LIVE album released by the label. Low production costs, I.E studio time, mixing, etc. I love how your drawings seem as if they're not drawn digitally. does that make any sense? what did u use? I draw on Adobe Illustrator for my cartoons. A lot of people I know use photoshop but I'm useless on that software! Love this, its so very true! Are you from Idaho? Just wondering because of the Boise reference. Though I would totally understand if you had something against Boise. KHill: I'm not from Idaho, and I've never actually been there. Nothing against Boise. It's the hometown of a band, Built to Spill, that was a favorite of mine in college. It also seemed like the perfect off-the-beaten-path city for the humble beginnings of a fake band.